The Singapore Turf Club introduced the S$1 million race to supplement the programme of the Singapore Airlines International Cup on May 12, 2001. Held for three-year-olds and upwards over 1,200m, France's three-year-old IRON MARK proved a shade too good for local sprint sensation TRILLION WIN. In 2002, another three-year-old from Australia, NORTH BOY won the sprint in course record time of 1 min 9 secs. The 2003 running was cancelled because of the outbreak of the SARS virus. 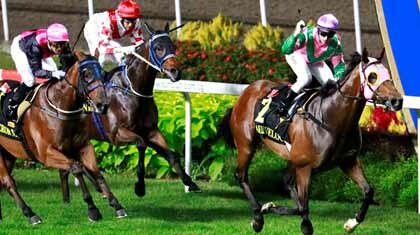 The Singapore Turf Club discontinued the race in 2004 but brought back the race as KrisFlyer International Sprint in 2008 when Australia's fairy tale racehorse TAKEOVER TARGET scored a thrilling win in course record time. Former Hong Kong champion SACRED KINGDOM set a new course record in winning the event in 2009. The KrisFlyer International Sprint was accorded international Group 1 status beginning 2010. LUCKY NINE became the first horse to score back-to-back in 2013 and 2014. The Singapore Turf Club decided to discontinue the race from 2016.